Foam Rolling – Why you should do it! You are here: Home / Blog / Activities / Foam Rolling – Why you should do it! If you haven’t heard of foam rolling before, it involves a cylinder and rolling on it over areas of your body that get tight and sore to help release the muscles. It is a great tool to maintain your muscles daily and between massage treatments. Increases the blood flow to your muscles, this then improves the delivery of oxygen during physical activity. Can help to relieve muscle tension especially after working out. Can improve Range of Motion; by stretching and lengthening your muscles you can then get more movement out of them. This also improves flexibility. Decrease recovery time, leaving your muscles feeling better after excessive physical activity. When should we use a foam roller? 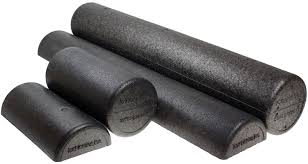 As they are a beneficial tool to warm up muscle groups before exercise, you should roll over each muscle group 2-5 times at fast rates for a warm up, and for recovery after physical activity you should spend 10-30 minutes of slower rolling over affected muscles, each day until muscles are feeling good again. Even if you haven’t been doing physical activity and your muscles are just feeling tight; foam rolling can help give you some relief. So listen to your body; if it is aching and feeling tight, jump on your foam roller and help your body out. TALK TO ONE OF OUR HELPFUL STAFF NEXT TIME YOU’RE IN!